Of course I have great respect for great beers. But even more so, I've developed a love for ones crafted using only one type of hop. It seems to me quite an impressive feat to retain complex flavors without using a complex array of ingredients. 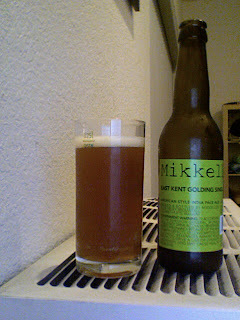 This beer happens to be with the East Kent Golding hop (from Europe, traditionally used in English beers). It's superb, and reminds me of drinking a nice heavy ale mixed with some apple cider. The bitterness is almost perfect, but I think if could be a bit more aromatic - that would take this to 11. Yes I wish this was a few dollars cheaper, and for that reason I probably won't be buying again, but I still think this would've scored high at the blind IPA tasting, right alongside it's brother Green Gold. And heres another thought: how great is it that a top-notch Belgian brewery has been making "American style" IPAs? That sure does make me proud to be and American, cuz at least I know I'm free. I know you're proud to be an American because you can not spell correctly. And we all know if you're a god fearing true proud American then proper spelling is a huuuuuuuuuge no-no.